Within the beautiful landscape of Aslarga resides the home of the Mystery Dungeons — complex and dangerous labyrinths whose structure changes with each new venture inside. A steady stream of adventurers, all supported heavily by the local government, flock to the town to conquer these Mystery Dungeons and discover the secrets hidden within each one. 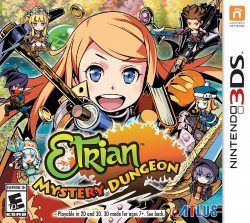 Etrian Mystery Dungeon — the brainchild of Spike ChunSoft’s Mystery Dungeon and Atlus’s Etrian Odyssey — has a story that unfolds carefully and deliberately, gradually introducing the player to the town’s economy, back history and characters. This keeps the plot from becoming overwrought and complicated, due to both franchises’ penchant for simple yet effective storytelling. 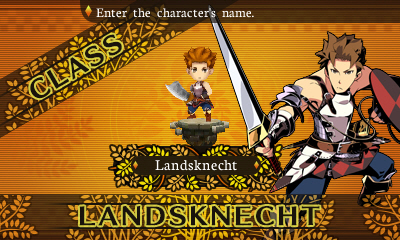 When first starting the game, you must choose your avatar character’s class (which is a false positive because you only have Landsknecht — the Warrior/DPS class — to pick from in the beginning), your gender, and one of four color variations. Afterwards, you’re whisked off to the land of Aslarga and your first dungeon with the task of clearing it before earning the right to make your own guild. The dungeon itself functions as the game’s tutorial as you learn about traversing the environment and enemy encounters. Once the mission is finished, you can choose from six initial classes (Landsknecht, Protector, Gunner, Runemaster, Medic and Dancer) to start your guild with, with four more unlocking later on (Hexer, Ninja, Sovereign and Wanderer). Each class has a unique specialty and role in combat; it’s up to the player to effectively utilize their given skillset to best draw out their full potential. As an example, the Protector is the tank of the party and must always make sure to draw as much aggression (or “agro,” for those of you familiar with the term) from the party as possible while beefing up her own defenses. A Landsknecht or Runemaster, however, must focus on maximizing her damage output instead. Coming back to labyrinths, each one is grid-based made of two parts: the corridors and the actual dungeon sections. Enemies reside in these sections and battles take place in the same dungeon field that you travel in. 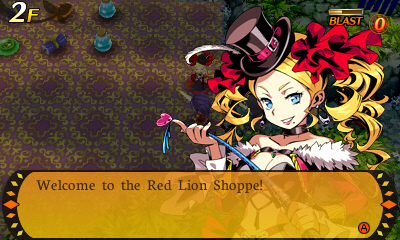 Despite this, Etrian Mystery Dungeon is persistently turn-based. With each action, a turn passes by; an action is defined as using a skill, attacking or moving one square on the grid. When a turn passes, several things occur: FP decreases, HP recovers and any enemies present may move a grid or attack if in range. In corridors, however, everything but enemy activity can occur. FP measures your satiety and is a stat unique to the party leader. As a leader, they have several duties and are under heavy pressure, which is visible in the FP meter. It depletes as turns go by, and if it reaches 0 percent, your HP will decline. You need to eat food, such as bread, to restore this stat. Another method to control this is to switch party leaders, splitting the burden of of the FP meter and extending your stay in a dungeon. Standard melee and long-range attacks are naturally available during combat. There are seven attributes that an attack can have: Cut, Slash, Bash, Fire, Ice, Volt and Untyped (a non-elemental attribute, so to speak). The first three are physical attributes that can be applied to different family of weapons and the last four types are elemental typings. Each skill or weapon will usually possess one or more of these attributes and it’s important to pay attention to enemy weaknesses to these attributes to maximize damage output. Special abilities, called skills that are unique to each class, are also available. 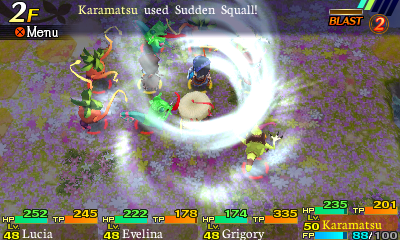 Skills are acquired through the skill tree used in Etrian Odyssey. As you gain skill points during battle, you can unlock new skills. Each skill can be upgraded to enhance its effects, such as dealing more damage or increasing its defensive power. The skill tree is separated into Novice, Veteran and Master sections and as you learn all the skills from an earlier section as well as reach a certain level, the advanced section becomes available. Skills use up TP and in order to restore this stat, you can either defeat monsters or step on special amber covered squares, which have another purpose. When stepping on one, an extra command is added to possible orders, allowing the party to move into formation at once. The benefit is that this massive movement only uses a single turn. Battles are turned-based as well and take place on the same grid as movement. When the party comes into contact with a foe (contact meaning that it is in range to attack or be attacked), that enemy will begin to attack. Players directly control the party leader and any other allies behave according to the directives provided to them. Combat itself is fun, strategic and rewarding with battles managing to balance those attributes while remaining satisfyingly fast-paced. There are also special commands that can be executed only while using something called a Blast meter. 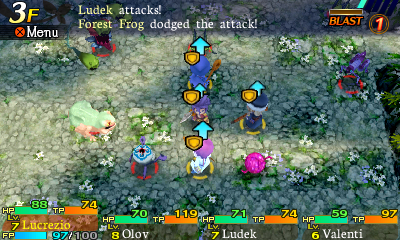 This meter fills up as the party defeats foes and lets the party leader dish out orders to the party such as taking full control of each party member, organizing their auto-attacking on a single target instead of naturally spreading out, fanning out to better explore a level and other such commands. The only exception to this rule are boss battles, which allow the player to completely control party members without the use of the Blast meter. This departure from the normal control scheme is absolutely necessary as bosses are very difficult and do not hesitate to overwhelm with powerful skills of their own. What makes this complete control mechanic so interesting and simultaneously frustrating is that players must have full knowledge of that classes’ skill range — there are no helpful color-coded squares pointing you in the right direction (for instance, if you don’t understand the attack range for Runemaster spells, you’ll be watching that powerful magic fling uselessly, along with your now wasted turn). 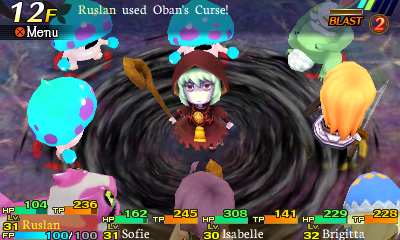 This may seem a bit punishing (and it truly is at times) but the mechanics truly forces you to pay attention to skills and their effects, heightening the strategic element of boss battles even more. In each dungeon there are plenty of items to collect, including usable items and materials. Just as in any self-respecting dungeon-crawler, there is a strictly enforced inventory limit. This means that any excess items cannot be picked up until you discard or use an inventory item. Regarding materials, they are thankfully kept in a separate section and do not affect inventory limits. Players can garner materials from fallen foes, Mining Spots, Lodging Spots and Harvesting Spots. When sold back to the town store, these open up new equipment for purchase, open up more forging options for currently owned equipment or complete certain quests. 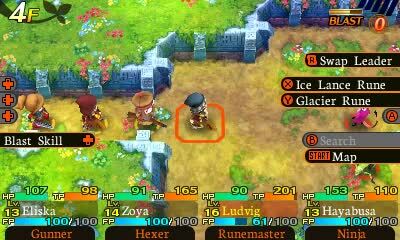 Etrian Mystery Dungeon retains traditional dungeon-crawler difficulty, which means that not only can enemy encounters be very unforgiving to unprepared parties, but if you lose a single battle your money, items, experience and earned skill points (including any increased levels) all goes with that loss. However, unlike old-school dungeon crawlers there are several precautions that can be taken to prevent such an unfortunate event. Both items and money can be stored away at the inn to keep it safe in case an expedition goes horribly wrong. Levels and general experience can be preserved by using the Ariadne Thread, allowing for instant escape from any dungeon. This item is a true blessing when you find yourself in an unwinnable battle or a scenario with no items and little prospect for continuing exploration. On a tangent concerning this item is something I found quite problematic. The game makes it quite clear from the beginning that this item cannot be used on the bottom floor of any dungeon, meaning that a party wanting to escape must find their way to another floor first. While harsh, I found this mechanic a welcome challenge to keep that item’s use in check, so to speak; although I did dislike that you cannot purchase Ariadne Threads in stores, only being able to garner them through quests. I later noticed a new item for sale in the shop, a Nether Dust, which is a very expensive variety that either heals your party fully or allows you to escape from a bottom floor. This puzzled me because it completely negates the purpose of having that restriction on the initial item in the first place. Why have an more expensive version of the same thing, when the restriction could have been simply removed in the first place? A special and hard to learn skill could have also been made available to upgrade the item as well. Or simply have it use the effect of a full heal while keeping you on the bottom floor, which would certainly make the high price understandable. There is another option for saving fallen party members: form a rescue party with the back-up members that reside in a fort and then descend to the floor where your original party is. Although your reserve members do earn experience, their lack of proper equipment and items make the journey treacherous, ensuring this mechanic is not abused by players. 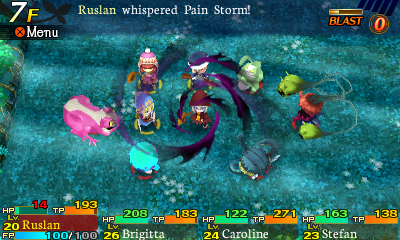 Moving on, for those not familiar with the Mystery Dungeon series, battle operations can be a bit confusing at first but becomes second nature through repeated practice and application. The same cannot be said of the UI, which piles on too many commands into the same controls in a very non-intuitive manner. Trying to remember which button combination brings up what menu and which attack does what is more like trial by fire, and can give one an appreciation for the game being turned-based. The most useful features of the UI, though, are the use of shortcuts to cast skills faster and the ability to turn off certain skills. As mentioned earlier, party members are controlled via AI and the skills they cast are based off what they’ve learned. This can be troublesome when they decide to unnecessarily use certain skills and waste valuable TP. Turning off skills is incredibly useful to offset this issue, since it allows you to control when they use a skill as well as giving you more ways to customize their skill set and therefore role in battle. Dungeons themselves run in a roguelike fashion, in which it changes layout every time you reenter it, meaning that early on when trying to complete main story quests it’s best to push through in one go after level-grinding enough. However, there is a way to lock in a dungeon’s layout to keep it stable: building a fort. Once at least one fort is built, the labyrinth’s layout is fixed. 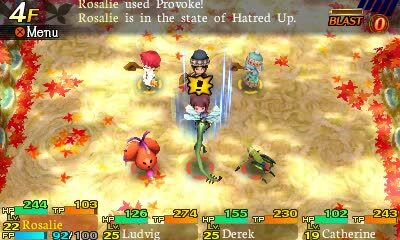 There are different kinds of forts available to build with various effects on party members and other strengths. Forts also serve another and even more vital purpose: they protect the town from DOE invasions. A DOE is an incredibly powerful monster that lives in the labyrinth; most of the time your party should avoid them but occasionally you’ll be forced to engage. Normally if you lose the battle or the DOE makes it to the top floor of the dungeon, it will invade the town and destroy a building. An erected fort, though, will attract that monster and be destroyed instead, saving the town. You can also choose to engage a DOE, which is the path of most resistance in this case. These enemies are incredibly, psychotically difficult and their insane defense ignores character level; in fact the only way to even damage them in the first place is to cast buffs and debuffs first. Worrying about these foes while simultaneously keeping your party alive and thriving is arduous but well-realized and, like the other aspects of combat, strikes a genius balance between “challenge” and “fun” that one normally wouldn’t associate with a game of this genre. While battles are well-polished and modern, movement controls are rather awkward and strangely old-school — in a bad way. When using the D-pad, the characters will often stiffen up and be harder to move for about a second. Using the analog stick instead causes the exact opposite issue: floaty and inaccurate controls. Facing in certain directions, especially diagonally, can be an exercise in futility. 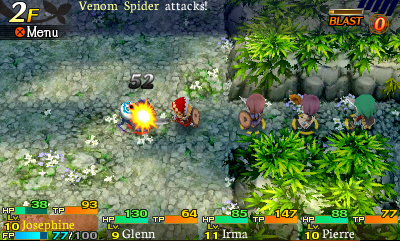 Facing the correct direction to attack a monster is crucial, as the wrong direction can cause a missed attack and wasted turn. However, at times the D-pad becomes a bit stubborn and I end up having to use the “Y” button feature constantly for precise turning. Outside of battle is the delightful task of redevelopment; by spending money you can invest in and improve each district: Hotel, Market, Eatery and Guild. It’s optional but increasing a district’s star rating will net you new rewards and benefits, greatly benefiting you in the long run. 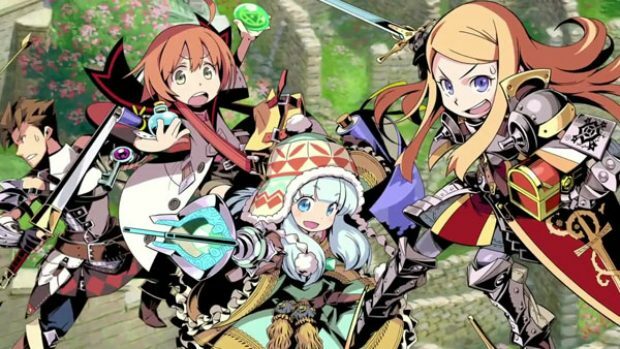 It’s almost staggering just how well Mystery Dungeon and Etrian Odyssey mix — the graphical style, the gameplay, story, characters, mechanics all come together in a near perfect blend of turn-based JRPG and rogue-like dungeon crawler that could easily have you believing this game was part of a long standing franchise. The music is excellent, featuring a nice blend of the two franchises’ style. Both town and general dungeon music is some of the most soothing and peaceful tracks I’ve heard in a while. Boss battles and DOE fights are accompanied by epic sounds that really involve you in the hectic struggle of keeping your party alive, knowing that failure comes with a steep price. Of course the artstyle and 3D models are adorably rendered, and the dungeons are filled with beautiful details that set each one apart aesthetically from the last — no mean feat considering the simplicity of the graphics. What’s truly incredible about Etrian Mystery Dungeon, however, is how well-balanced the staggering number of mechanics, battles, side quests, projects are. Never did I once feel overwhelmed with the sheer number of activities; I simply took each new development in stride and learned to incorporate it into my daily grind. If you haven’t played a dungeon-crawler title yet, start with this one. It never abates on the difficulty but simultaneously introduces mechanics and items that still make the title — and genre — accessible to first-time players. Plenty of love and care between the two development teams has been put into this title and, despite the smaller setbacks, it truly shines in the end product.